When you think of animal studies that lead to new treatments for hearing loss, you may think of studies on mice. But scientists are looking further this time to an animal that’s not even a mammal. In fact, it can’t even hear. This animal is the sea anemone, an animal that may look more like a plant to us with its stationary lifestyle and long flowing tentacles. This earless critter may just hold the key to preventing hearing loss and restoring hearing. In mammals like dogs, rats, and humans, we hear sound by translating the vibrations that things around us make when they move in specific ways. Sound waves flow out from a source like ripples in a pond. It doesn’t matter if that source is a motorcycle engine revving or vocal cord vibrating to form speech. When exposed to loud noises, these little hairs become damaged. Unlike many other cells in the human body that can be regenerated, when these hair cells become damaged, they cannot repair or replace themselves. Flea and tree begin to sound the same. Words sound mumbled. Ringing or pain may even result. Carrying on a conversation is hard. You start turning the TV all the way up just to hear it. Over time a person may lose their hearing altogether. 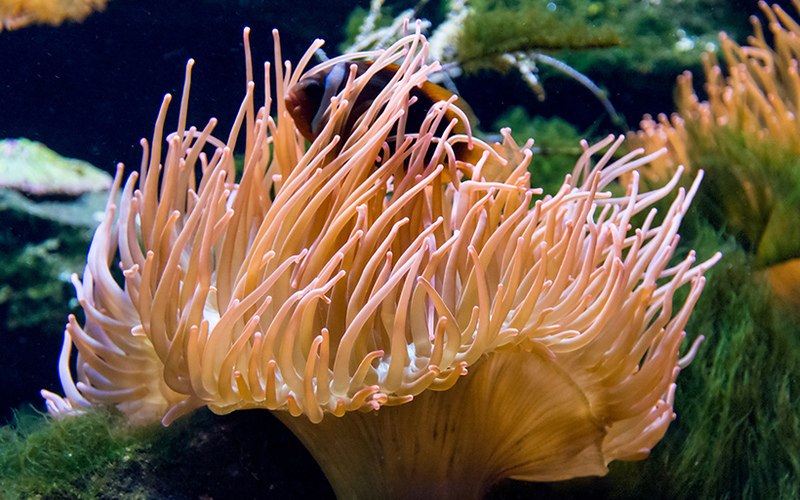 The tentacles on the anemone happen to be very similar to the tiny hair cells in your ears. Research has shown that these animals repair their tentacles using a protein. They excrete this protein all over their bodies when damaged. These proteins jump into action, restoring that limb. Observing this phenomenon, scientists got curious. Could this same protein repair the hair cells in a person’s inner ear? They tested their theory on mice who have very similar hearing structures to humans. They used a relatively humane surgical technique to damage the mice’s hair cells in their ears. Next, they applied the protein from an injured sea anemone. The results were a significant recovery of those hair cells in each mouse. Mammals have a protein that is similar to the repair protein found in sea anemone. They hope that through further research they can learn how to use this protein to repair damaged hair cells in the inner ear. Currently, there are few options for treating hearing loss. While effective at restoring hearing, current hearing loss treatments don’t heal the part of the ear that’s damaged. This protein may be able to do just that and it could open up a whole new kind of therapy for hearing loss.